lower center in brown ink: Le lettere A e B denotano i canali da empire il bicchiero, et i Canali sono due p[er] poter da uno / mettere vino bianco, e dall'altro vino rosso, i Cavalli Marini si empiranno di vino bianco / et l'altri mostri marini di vino rosso. (The letters A and B indicate the channels to fill the cup, and there are two channels so that one may pour white wine in one and red wine in the other. The seahorses will be filled with white wine and the other creatures with red) (trans. William Breazeale). Thomas Tomkins (1743 - 1816). (sale, Mr. Hickman's Gallery, London, 25-28 February 1818, no. 289). Robert Stayner Holford [1808-1892]; his son, Sir George Lindsay Holford, K.V.O.C. [1860-1926]; (his sale, Sotheby's London, 22 May 1928, no. 29B). (sale, Christie's London, 18 March 1975, no. 80). Wolfgang Ratjen, Munich; purchased 2007 by NGA. 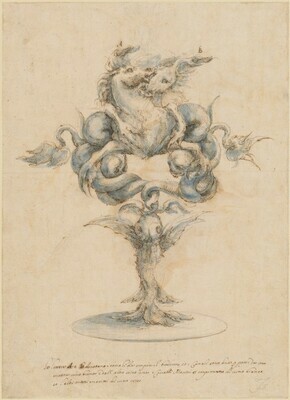 Italian Master Drawings from the Wolfgang Ratjen Collection, 1525-1835, National Gallery of Art, Washington, DC, 2011, no. 33. Disegni di Stefano della Bella. Il Gabinetto delle Stampe. Milan, 1976: 9. Ward-Jackson, Peter. Italian Drawings, Volume Two, 17th-18th Century. Victoria and Albert Museum Catalogues. London, 1980: 18, under no. 625. Heikamp, Detlef. Studien zur Mediceischen Glaskunst: Archivalien, Entwurfszeichnungen, Gläser und Scherben. Florence, 1986: 309.